Sudan has deployed paramilitary forces at its borders to curb the flow of migrants transiting on their way to Europe. This move is controversial as the troops fought in Darfur, where they have been accused of committing war crimes. 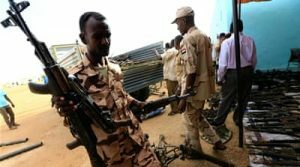 The Rapid Support Forces, as the group is called, was officially formed four years ago and have been accused of brutality and violating human rights for their role in the Darfur conflict but the head of the forces say they fight crimes, they do not commit them. Al Jazeera’s Hiba Morgan reports Northern Sudan.